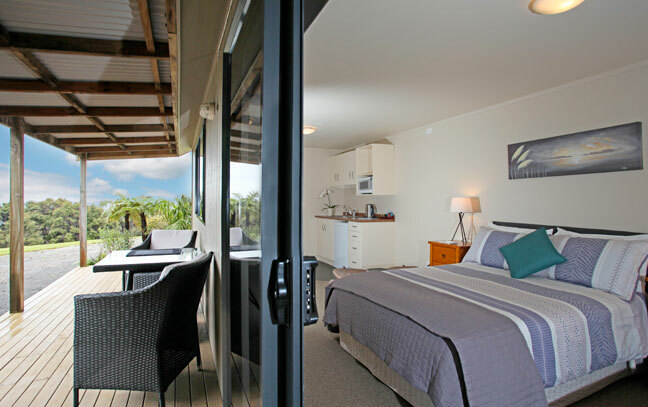 Tui cottage is furnished with a double bed & king single bed. Great for couples, twin share or can include a roll away for families of four. Tui comes fully equipped with en suite, kitchenette, TV and complimentary Koha Spa toiletries. Included in the room rate is a full continental breakfast – already provided in the cottage to be enjoyed at your leisure. Breakfast consists of: freshly baked bread bread, fresh NZ fruit, local yogurt, beautiful gluten free muesli, jam & spreads, NZ fruit juice, milk, tea and coffee. All effort is made to provide locally grown produce. Please advise us in advance if you have any special dietary requirements.